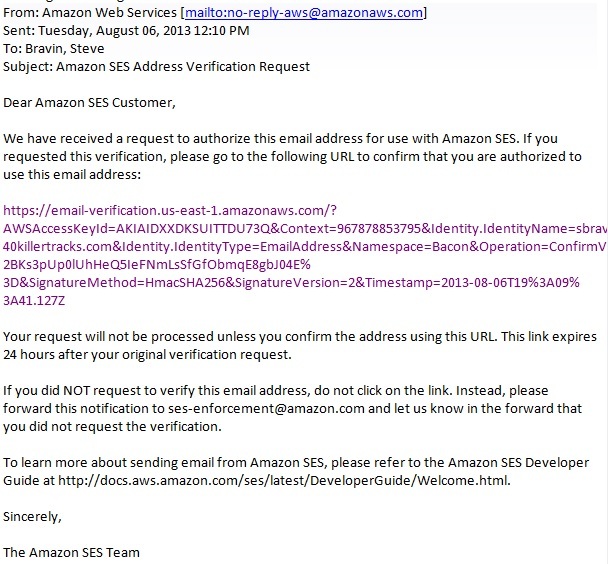 When you send a package for the first time you will receive a Amazon SES Address Verification Request email from Amazon Web Services (AWS) asking you to authorize your email address for use with StudioCDN. Note: StudioCDN is hosted on AWS and this is a security feature to help protect you from spam and other attacks. Please click on the link given in the email to authorize your account and have full security benefits. This page shows you how to install StudioCDN on your Mac OS X computer. – Mac must be running OS X 10.7 (Snow Leopard) or higher. Open Applications and see if you have a previous version of StudioCDN installed. If you do first drag any icons from the Dock onto Trash to remove them. Then drag the application from Application onto Trash to uninstall. 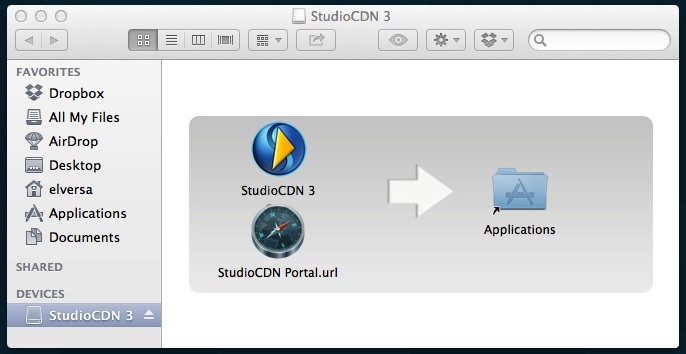 To install StudioCDN, Drag the StudioCDN icon and drop onto Applications folder to install. Please wait for the installation to run, the Application icon on your dock will jump up and down when complete. To install StudioCDN Portal, Drag the StudioCDN Portal icon onto Applications folder to install. Repeat with the StudioCDN Portal.url icon. This will install instantly. You can now close the installer. Open Applications and drag the StudioCDN icon onto your Dock for easier frequent access. Open Applications and drag the StudioCDN Portal icon onto the right side of your Dock. Hold the icon underneath the others so they move apart and make a space for you to drop it. This icon cannot be placed in the normal Dock area. There will be a temporary StudioCDN installation file on your desktop. You can drag this to Trash to tidy up. When you first run the client you will see a warning that the application was downloaded from the Web. Please accept this to continue. At this stage you have now successfully downloaded the StudioCDN application. This next section goes over how to configure the StudioCDN application for use. First open the application. StudioCDN has two pages, the Sending and the Configuration page. The application always opens up to the Sending page where you securely send files from your computer. To switch to the Configuration page please click on the gear symbol located at the bottom of the application on the left corner. This icon is shown in the picture below. You have now come to the Configuration page where you are able to change Sender, Message, and Content settings. In order to use this application it is required to set up your Sender information. Depending on your organization you will either use a Desktop or Login Authorization. For Desktop you will only need to enter in your organization’s keyword, for Login you will also need to enter you sender email and password. While not required you can also change your default sending message as well at this stage. In the next section you can choose your own Subject, Body, and Signature. It is required that you have a Subject and Body for each package you send. If you know for certain your account isn’t immediately authorized or if you get an email from Amazon after sending your first package, please go to the third guide in the Installation section of the Documents page, “Authorizing Your Account After Sending Your First Package”. This page shows you how to install StudioCDN on your Windows computer. This can be done in the Control Panel -> Add or Remove Programs -> StudioCDN. Double click on the StudioCDN.exe file to begin the installation. It is recommended that you create a Desktop Shortcut for the StudioCDN application and the StudioCDN portal link. First open the application. StudioCDN has two pages, the Sending and the Configuration page. The application always opens up to the Sending page where you securely send files from your computer. To switch to the Configuration page please click on the gear symbol located at the bottom of the application on the right corner. This icon is shown in the picture below. There are two different ways to change your content settings. The first way is to do it from the sending page. If you haven’t set up StudioCDN to display the content settings automatically (which will be shown later in this guide) click on the three dots next to the advance options icon as shown in the picture below. From here you will be able to choose from which account you want to send from, watermark content, determine if recipients can download audio and video files, allow secure forwarding, protect links, and choose the expiration date . The second way to change content settings is to do it from the settings page. Click on the gear symbol by the send button at the bottom of the page as shown in the picture below (depending on your computer’s OS it will either be in the left or right side). The content settings options are located at the bottom of the page. From here you can change the download and forwarding options, and can also choose whether to send project info and to show advanced options by default on the sending page. 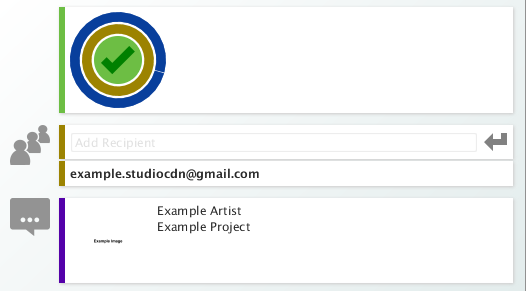 There are three ways to add recipients to the StudioCDN application. The first way is to manually type in the recipient’s email into the Add Recipient Box as shown in the picture below. Once you’ve typed in a valid email address the arrow on the right hand will turn green. You can either click on the arrow or hit enter to put in the email address. 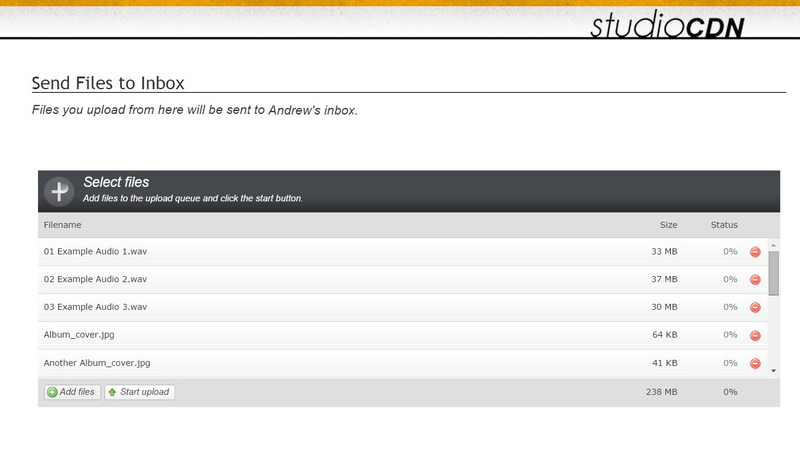 The second way to enter recipient’s email address is to drag it in into the StudioCDN application. The third way is to enter in a CSV file which is explained in the CSV guide. There are three requirements In order to send files in the StudioCDN application. You need to have at least one recipient added, at least one file attached, and have a message subject and body. When the requirements are met the Send button will turn from grey to green. When you are ready to send, click the send button. A loading circle will appear at the top of the application. When a green checkmark appears, as shown in the picture below, the package has been sent. There are two ways to add files in StudioCDN. The first way is to select the blue paperclip icon as shown in the picture below. This brings up the select file menu where you are able to select one or multiple files. To choose multiple files you can either choose a folder, select a group of them with the shift key, or choose one at a time with the command key. You are also able to choose any type of file to send. 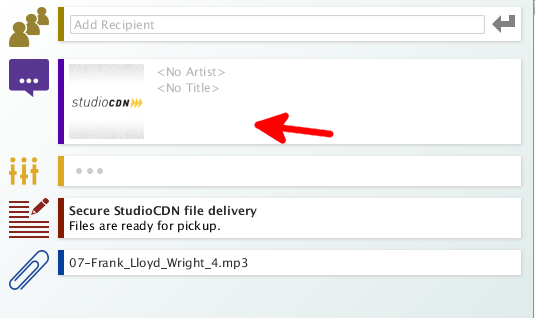 When you have selected the file(s) that you want to send click the Open button to add to the StudioCDN application. The second way to add files is to drag them into the StudioCDN application. You are able to drag multiple files or a folder into the application as well. To create a personalized message for your StudioCDN package click on the red pencil and paper icon as shown below. You are now able to change the header and the body for this particular package. If you wish to close the StudioCDN message editor click again on the red pencil and paper icon. The StudioCDN application will begin with the default message as shown in the pictures. To change your default message please go to the settings page by clicking on the gear symbol at the bottom as shown by the picture. In the middle of the application in the Message area you can change your default Subject, Body, and Signature. It is required that you have a Subject and Body for each package you send. In StudioCDN if you include a audio file a new section pops up which allows you to include information about the artist and album. In order to edit the information about the Artist Name and the Project Title click on the Purple speech icon which is shown in the picture below. At that point the two text fields will be able to be changed. To close out of the edit information section click on the purple icon again. To include a Album Cover click on the StudioCDN default image which is right next to the purple speech icon. This will bring up the open menu and from there select the album cover that you want. So for the following info for the package sent as shown in the picture below. It will appear as this to the sender. A CSV (Comma-seprated values) file is a Excel document type that stores data, such as email address’s. StudioCDN is able to import CSV files that contain email address’s so that you don’t have to type them all out manually for each package. A CSV file can be created in Excel or in a text editor such as NotePad or TextEdit. 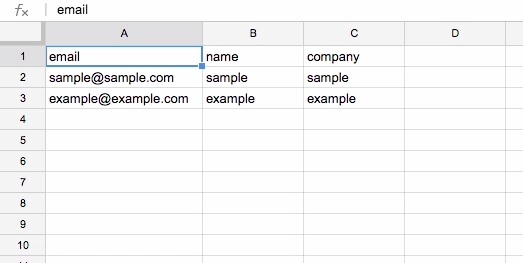 To create the CSV file in Excel, open a new document and create a column for email and then enter the email addresses by each row. You also have the option to create columns for extra information such as name or company which follow the email address as shown in the picture below. You have the option to include extra columns with even more information, but this extra information will not be imported into the StudioCDN application. Save the file with the .CSV file extension (when saving the file type .CSV after the filename). If you create the CSV file in a text editor, create a one column email list with the first line being “email” as shown in the picture below. Save the file with the .CSV file extension and the next time you open the file it should open with Excel where you can add the other columns if you wish. Once you have created a CSV file you can import it into StudioCDN by dragging the file into the application. If you typed in one of the column names wrong or entered an incorrect format for the email address the StudioCDN application will let you know (if you have multiple errors it will only point to the first error). There will also be a green reload symbol that comes up as well as displayed in the picture below. If you change the file in anyway you can update the StudioCDN application by clicking on the green reload symbol. 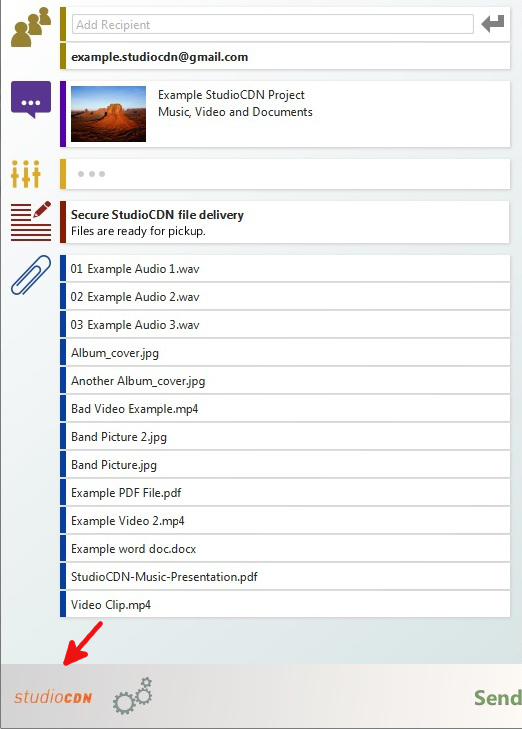 There are multiple ways to download files that you receive from the StudioCDN application. You are only able to download Audio/Video files if the Sender has allowed you to do so. If you wish to download one file, click on the yellow downward arrow icon next to the desired file as shown in the picture below. If you want to download multiple files first install the Media Science International’s Multiple File Downloader Extension for your current browser which is explained in their respective guides. You can download them Here. When you receive a Audio, or Video file(s) from a StudioCDN user, you will always be able to stream/view the file within your web browser. Click on the file (not the download icon) in either two locations to select which file you would like to stream/view as shown in the image. This will then be played in the media player in the right top corner. From the StudioCDN received content page you are able to forward the content to other people. In the Info Section, located at the bottom of the screen, there is a Forward to Email box, enter the email address of the person you want to forward to and press the Forward Package button as shown. You can also configure for other users, regardless if they have a StudioCDN account or not, to send you content securely using the StudioCDN service. 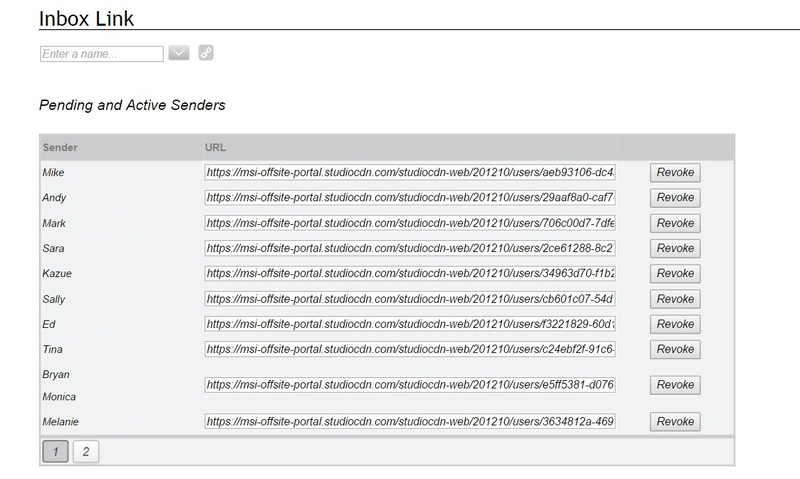 On the StudioCDN Portal main page there is a second section called Inbox Link. Here you can add different users each with their own specific URL. You can add users with the Enter a name… text field at top and can remove users by clicking the Revoke button with the corresponding user. When you add a user they will then be able to send files to you online using any web browser. By selecting on your specific URL link that they will be sent in an email they can send any file securely to you as shown in the image below. You can add files by clicking on the button below or by dragging them into the web page. When you are ready to send click the Start Upload button. The StudioCDN Portal is where you can keep track of and change the options of your sent packages online. You can also access the StudioCDN client application from here as well. To access the StudioCDN portal, click on the orange StudioCDN logo in the bottom left corner of the application as shown in the picture below. (The StudioCDN logo is on the other bottom corner for Mac OS X).